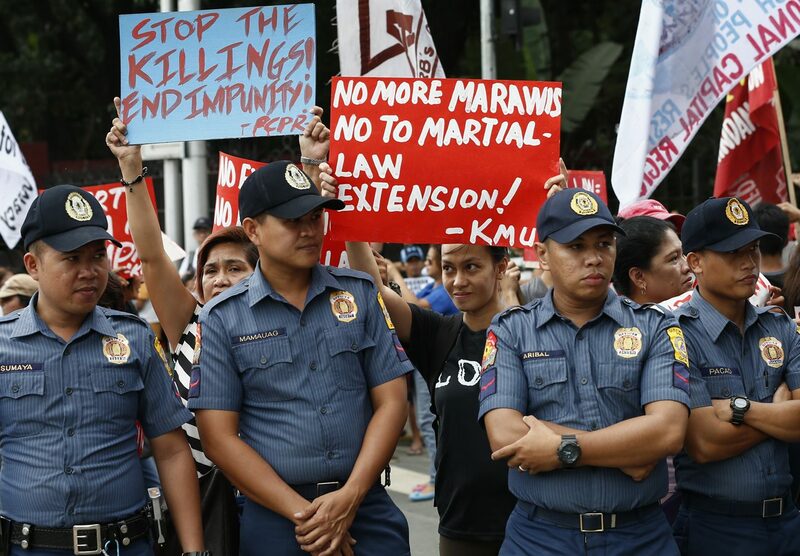 MANILA, Philippines (CNS) — Martial law in the southern Philippine region of Mindanao, originally aimed at quelling a terrorist attack in Marawi in May, has been extended for another year. Ucanews.com reported that on Dec. 13 a joint session of Congress approved a request by President Rodrigo Duterte to extend martial law across the region until Dec. 31, 2018. Legislators who opposed the extension said martial law in Mindanao has no basis in the Philippine Constitution and can lead to human rights abuses. Sen. Franklin Drilon questioned the inclusion of the New People’s Army as a reason for extending military rule, warning that it might be used as a pretext for extending martial law nationwide, ucanews.com reported. “If we are to believe that the government is intent on ending the war against the (communist guerrillas) … then it is entirely possible that (military) operations would have to be extended beyond Mindanao to meet that objective,” said Drilon. He said military rule would only affect the economic standing of Mindanao because investors are not coming in. “There are less investors because of (martial law). I think that is important,” said the archbishop. He said the situation in Mindanao can easily be handled by the local police and military stationed there. “People are saying that there is practically no martial law now, so it might as well go back to normal,” Archbishop Ledesma said. “The proponents and supporters of these dangerous moves are playing with fire that will engulf us all,” said Olalia. The presidential palace welcomed the congressional vote. “Public safety is our primordial concern,” said Harry Roque, presidential spokesman. “We ask the public to stand behind the administration and rally behind our defenders to quell the continuing rebellion in Mindanao,” he added. Duterte declared martial law across Mindanao following a terrorist attack by Islamic State-inspired gunmen in Marawi May 23. In October, the government declared an end to almost five months of armed clashes with the terrorists; the violence left the city devastated and close to 400,000 people displaced.